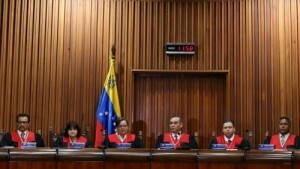 WASHINGTON - The United States has imposed sanctions on Venezuela‘s chief judge and seven other members of the country’s Supreme Court as punishment for seizing powers from the opposition-led congress earlier this year. Those sanctioned will have their assets frozen within US jurisdiction, and US citizens will be barred from doing business with them, the US treasury department said on Thursday. The new sanctions package was aimed at stepping up pressure on supporters of President Nicolas Maduro amid growing international concern over a crackdown on mass street protests. “The Venezuelan people are suffering from a collapsing economy brought about by their government’s mismanagement and corruption,” Steven Mnuchin, the US treasury secretary, said in a statement. “Members of the country’s Supreme Court of Justice have exacerbated the situation by consistently interfering with the legislative branch’s authority,” he said. Venezuela’s latest wave of anti-government unrest, which has left at least 44 people dead in the last six weeks, began when the Supreme Court assumed the powers of the National Assembly in March. The de facto annulment of the congress drew widespread international condemnation, and the decision was later partially reversed. Among those hit with sanctions was Maikel Moreno, a Maduro ally who became president of the 32-judge court in February. The sanctions came shortly after US President Donald Trump called the situation in Venezuela a “disgrace to humanity”. “People don’t have enough to eat. People have no food. There’s great violence,” Trump told a press conference with visiting Colombian President Juan Manuel Santos. Hundreds of thousands of people have taken to the streets against the Maduro’s government, demanding elections, freedom for jailed activists, foreign aid and autonomy for the opposition-led legislature. Despite its vast oil reserves, Venezuela is suffering chronic shortages of food, medicine and other basic supplies. The centre-right opposition blames it all on mismanagement and corruption in the Socialist government. Opposition leader Henrique Capriles said on Thursday that authorities confiscated his passport and prevented him from travelling to New York to discuss the country’s crisis with United Nations officials. Maduro’s government, however, accuses the opposition of seeking a violent coup and says many of the protesters are no more than “terrorists”. The US treasury department has in the past sanctioned Venezuelan officials or former officials, charging them with trafficking or corruption, a designation that allows their assets in the US to be frozen and bars them from conducting financial transactions through the US. The officials have denied the charges and called them a pretext as part of an effort to topple Maduro’s government. The Trump administration has threatened further measures against Caracas, but sanctions so far have stopped short of hitting the oil sector in Venezuela, which is a major US oil supplier.